Hi everybody! I have a new terrarium that I created for Nepenthes hybrids and Sundews. I started with a few Sundews, N. spectabilis x mira, a Sun Pitcher hybrid, and some sphagnum moss. Everything was growing great, then I got a new N. glabrata x hamata for Christmas and it has put out almost no growth. I decide that I needed higher temperatures during the day as the temps in the terrarium stays in the upper fiftys. What type of heater should I use? A heat pad or rock? The dimensions of the terrarium are 14.5in x 36in x 12in. Thanks! they come in different sizes/lengths providing different amount of heat. I just hang it midway on the walls of my tent hooked up to a controller. also important to minimize amount of air exchanging from inside and outside the terrarium or the heat will not help. you can see the cable in background of this photo. hope this helps! More info would help. For example what kind of lighting are you using? How close is it to the terrarium, is the terrarium open or mostly sealed what is it near? A window? Or just in a room or a cool basement? I have found for my indoor plants the easiest thing you can do is work with your lights. What I mean by this is let's say you have a 2ft. 4 tube t5 h.o. Flourescent fixture. In order to get the desired light intensity the light must be X amount from your plants. This light throws heat, thus warming your terrarium. I usually adjust my terrarium once I figure out how to set up my light source etc. I have a 40"x20 indoor greenhouse set up that I have various plants in. The lights can be no higher than about 4 inches from the top of this in order to provide enough light to the plants. This is fine in the winter as these plants are in my basement. It heats up the greenhouse but the cool basement temps counter some of the heat.. the cool basement provides a night time drop as well when the lights go off. I have two holes cut in the top for ventilation, during winter one is covered allowing it to heat up right to where I want it. During summer both are uncovered providing a bit more hot air release. Because the basement is warmer. I'm sorry if this reads a bit incoherent I have a headache today but I'm trying my best to make this make sense. . You have to find the balance. 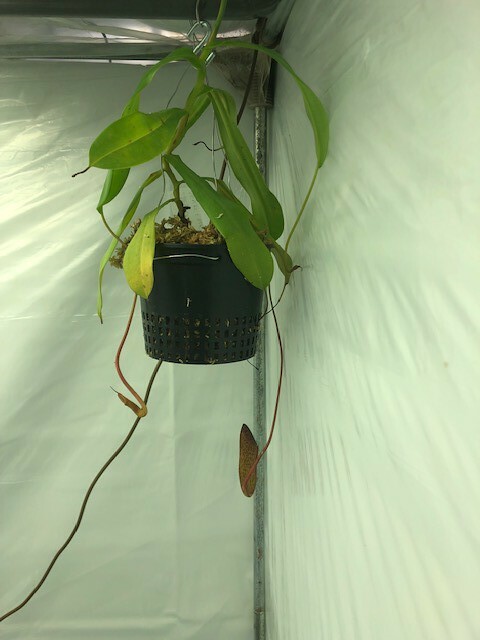 Get that terrarium up to about 68 (not ideal but what I consider a bare minimum)during the day otherwise your nepenthes will grow glacially slow and not be very robust. With that being said I keep my set up in such a way so that it's about 75 during the day and dips down to about 58-62 at night. Anyhow give us more info and it might be easier to help. On a side note in one of my grow spaces I have a seedling heat mat under a 1020 tray with a thin layer of pumice in the tray and some distilled water and it turns on an hour before the lights come on and it adds about 3-4 degrees to a 24x24x18 terrarium and some humidity. Thanks for the help! The terrarium is located in a basement that is always very cool, it is not near any windows. There are two square LED lights sitting on top. The terrarium is sealed except for a hole 4 inch hole between the two lights for ventilation. Defiantly very humid in there. I have the lights on a 14 hour timer. I have also heard fish tank heaters work well for terrariums I however have no experience using one of these, but it could be something to look into. What I heard is make a false floor out of plastic light fixture diffuser, and "set it off the bottom" with pieces of tubing or plastic napkin rings or whatever. Add 3 or four inches of water. Put in a totally submergible aquarium heater. Lay the heater down flat. Dial it to your desired temperature, and adjust as needed till you get the temp you want. Add water from time to time as needed. Adjust with the seasons as needed. Good to go. I did this, without a heater. Letting the home heating and cooling system do the work. So far so good for my needs. Last edited by pearldiver; 02-11-2019 at 09:12 PM. as long as it doesnt turn into algae soup down there its a great idea! I took all your advice into consideration and settled on the water at the bottom of the terrarium idea. My N. glabrata x hamata is making a fast come back and the spectabilis x mira is producing bigger and more colorful pitchers. Would show pics but attachments don't seem to be working. Thanks for all the help!! !